The Rednock School in Dursley in Gloucestershire won the people’s choice and awards for sustainability and architectural excellence in the RIBA Regional Town & Country Awards. Wings emanate from a central red hub, designed to be energy efficient and naturally light and airy. So pioneers of the transformation of the ‘beacon of sustainble school design’ called in experts to design and install their planned multi-use games area (MUGA) and keep the school open while still pushing forward design boundaries. The 1,400-pupil school turned to artificial sports surfaces specialists AP Thompson and MUGA manufacturer Zaun to provide it with a multi-functional state of the art sports pitch. With limited space and the need to keep open throughout the works, contractors built the new school on the old playing fields then demolished the old buildings to make way for the new MUGA. Zaun recommended its Duo6 Sports fencing with fixings every 200mm instead of 400mm. Each of the fixing points uses a rubber EPDM insert that insulates the panel from the post and so reduces rattle during play to a minimum. 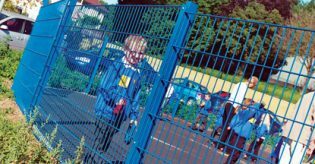 This is a solution Zaun has developed for schools to minimise noise from outdoor pitches distracting classes being taught indoors. Clever siting of goal recesses makes the MUGA ideal for a full size international standard football pitch or four concurrent 5 a side matches across the width. Zaun incorporated gates at strategic locations and 4.4m high fencing behind the goal areas to improve ball retention. The reincarnation of the school after four decades cost £38 million in total and includes a TV studio able to broadcast live to every corner of the school. It was a real challenge for the school and construction teams to build alongside each other and keep the school operational throughout, with surprisingly little disruption.